David Fairbrother, Director of ADDFollowing a successful trading history, A.D.D. Express, a West Yorkshire based transport company specialising in nationwide pallet distribution and a founder members of the PallEx network, have recently purchased a modern warehouse facility on the Lowfields Business Park in Elland. The building, which covers over 30k sq ft, is to accommodate an increase in business of both transport services and customer storage requirements. They selected Quickline Limited as their storage equipment contractor. After looking at various options with Quickline, A.D.D. decided to rack out approximately 60% of this overall warehouse area for customer storage and keep the remaining area as cross dock space. Quickline recommended that articulated fork trucks within this area would give them the most storage within the allocated area as well as being versatile for yard usage, etc. 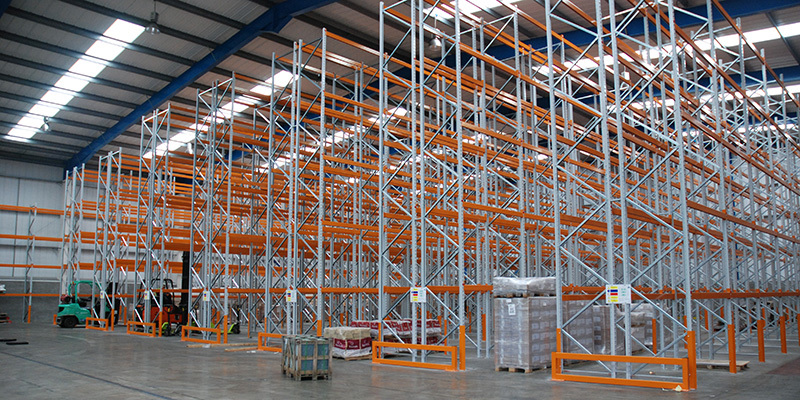 The adjustable pallet racking system, which provides over 2700 pallet locations, is installed over eight double runs and one single run across the warehouse, each with fork truck aisles of 2m. The frames are installed at over 8.5m at the highest point, giving four beam levels. As racking damage was a concern to A.D.D, each upright is protected by a bespoke sleeve guard. As well as this, the ends of the racks are protected by a twin box barrier. This reduces damage caused by fork truck collision.